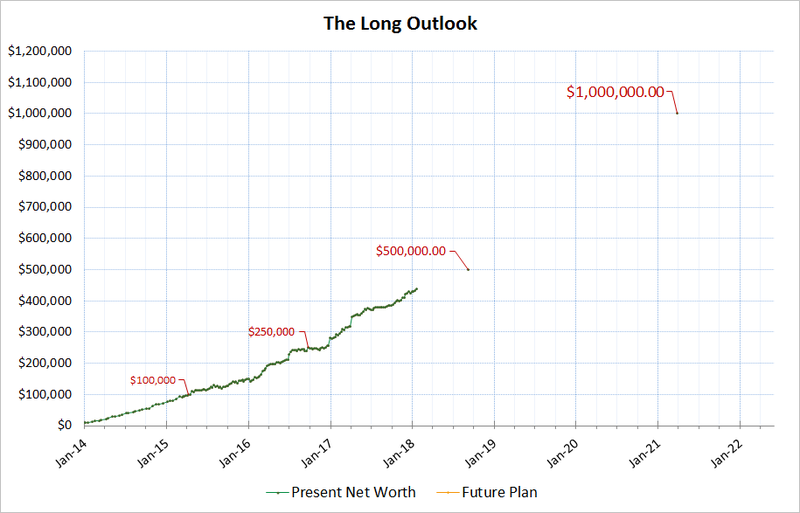 For new readers, the goal of this blog is to document my investing progress. This portfolio is based off the dividend growth investing philosophy. My goal is to achieve a high level of passive income from corporate stock. I want the companies to grow their dividends each and every year, at a rate healthy to their rate of growth. I want my companies to have a healthy payout ratio and be financially secure. The health of the dividend and the growth of the dividend is of highest priority. Capital gains is icing on the cake for me. 2017 had quite a lot of icing in addition to good dividend growth. All of my portfolio holdings pay a dividend to a degree, some large some small. My net worth has increased from $280,000 in the beginning of 2017 to around $440,000 as of today (January 19, 2018). A large part of this is from my income and savings. But another significant portion is from the portfolio doing work on its own. I have a large goal milestone in 2018, the 1/2 million dollar mark. It is starting to seem that each next $100,000 is becoming easier to achieve than the previous one. The first $100,000 was definitely for me the hardest. When I began investing, large percentage increases in the market did not really affect me since my portfolio value was small relative to how much I was adding every week (see the Jan 2014-Jan 2016 period, the portfolio basically moved up predictably as my contributions were so large relative to market gains). 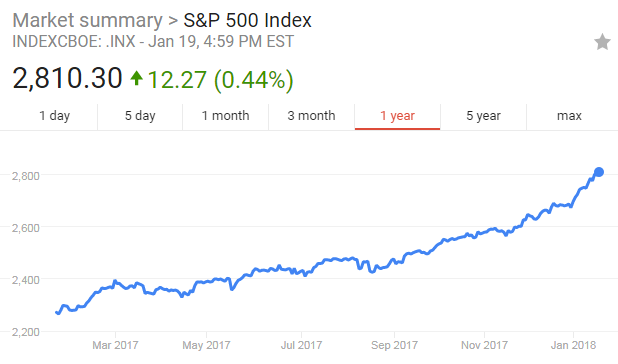 Since my portfolio is a chunky 6-figure size right now, market moves that are high (like the S&P500's 24% gain mentioned earlier) make huge impacts on my net worth. A 24% gain on $440,000 will be $105,600 which is visible. In terms of dividends, the trend is more predictable. Dividends are based off what a company is capable of paying its shareholders so this trend tends to be more stable and predictable. 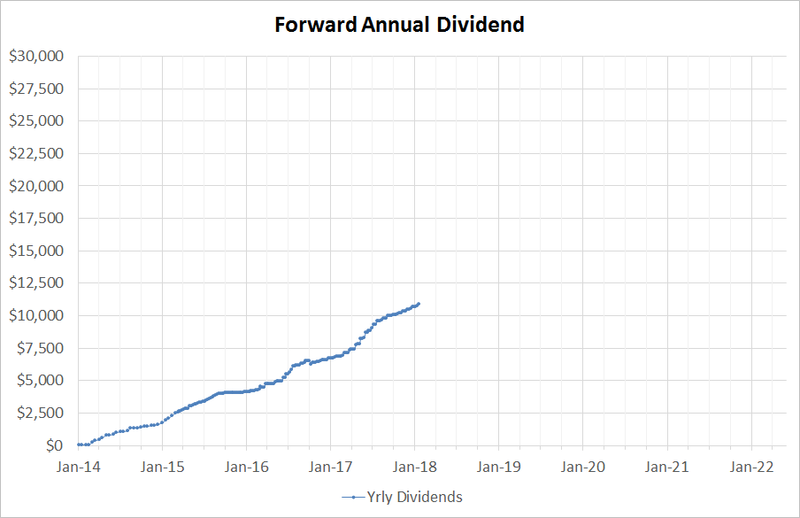 As of 2017 I have increased my dividend output from $6800 a year to now $10,800 a year. All of the companies that I held in 2017 increased their dividend. On average in 2017, my dividends were increased (average of whole portfolio) by 9.49% and the average yield of my portfolio was 2.62%. All dividend cash received was reinvested back into the portfolio. In total my portfolio was able to increase its income by 9.49+2.62% which is around 12% which is exceptional. I now have a lot of 5-figure portfolio positions. Some of them are getting quite large. For example, MO and PM are over $30k. JNJ, HD, and Visa are all over $20k. I have not really expanded into many new companies in 2017. I have mostly already found which companies I like best to invest in and tend to stick to those. I did add General Dynamics to my industrials in 2017. Overall, most of the portfolio was business as usual. Dump extra money into whatever looks like a good buy and reinvest the dividends. Rinse and repeat. 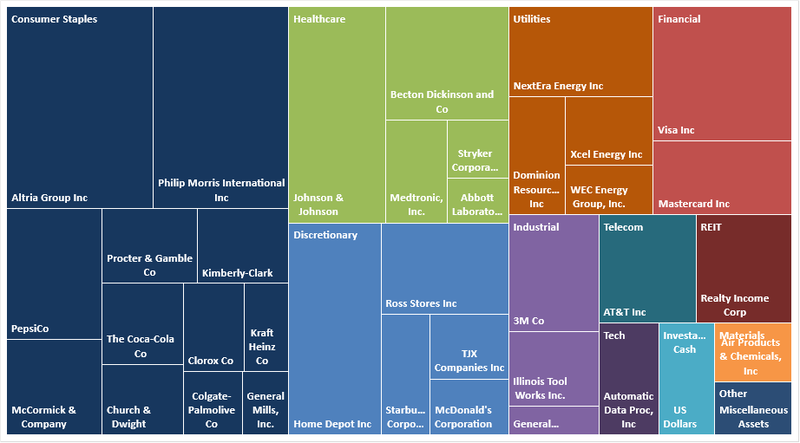 Most of my portfolio is saturated in consumer staples companies. Since the 2017 rally was predominantly technology, industrials, materials, and discretionary, I did not participate as fully in the rally due to my over weighting in staples. However, my portfolio's focus is not on capital gains but in the growth of the income. All the consumer staples companies I held increased their payouts handsomely in 2017 and they all have good yields compared to the more cyclical companies. I also want to invest with the long term outlook. A good year is a good year, but I do not have to chase growth in order to achieve my goals. As long as the income stream flows in every month, I am content. The sector distribution of my portfolio will not have such a large alpha during cyclical good years; however, it ensures a less volatile price trend when things do go bad. And on good years, this portfolio sector balance still benefits with a healthy dividend payout ratio. It is a balance between volatility and reward that I have decidedly settled on when I began investing. Best wishes to all investors in 2018. I will post my recent buys for January 2017 soon. Good Looking Portfolio YD. Did you recently sell some of your SO? For some reason I was thinking you owned more. I'm hoping to make a decision on a Utility buy within the next few weeks. Money Hungry, yes I did sell SO and replaced it with T. SO had a 5.22% yield an T a 5.37% yield when I swapped and both are at depressed levels. I added to XEL, D, WEC, and NEE last week (small amounts). Note WEC announced a dividend increase of 6.25% from 52 cents to 55.25 cents a quarter. A summary of your portfolio is present here for your work. You can get the theme for your business and can registeryour name here. There are best http://www.thesisghostwriter.com/our-services/thesis-editing-services/ with which you can see the growth for the better economy. Enjoy this great session.